HAPPY FIRST BIRTHDAY, URBAN ARTIFACT! Celebrate their birthday on Saturday with the first edition of their special Anniversary brew; cellared versions of some first year favorites: Phrenology (wild IPA), Hippodrome (wild DIPA), and Thoroughbred (bourbon-barrel aged amber); the kickoff of Keypunch (their lime gose); the limited Steinbier brewed for their Stein club members and unique guest taps. See their Facebook event page for more information on their musical offerings. • Christian Moerlein Malt House – A toast at noon, free tours, free food and more. Check out their Facebook event page for more information. • Country Fresh Farm Market and Wine Depot – Sierra Nevada Beer Tasting Friday from 4:00-7:00 pm. • Jungle Jim’s – Friday night tasting from 5:00 to 9:00 pm at both locations. Pints are usually $3. This week, they are pouring beers from Fat Head’s at Fairfield and from Deschutes at Eastgate. UPDATE • Party Town – No Friday Night Flights this week per a post on Facebook. They will return next week. • BC’s Bottle Lodge – Fat Head’s Brewing / Boulder Beer Takeover tonight from 6:00-9:00 pm. Beers include Boulder Shake, Boulder Sweaty Betty, Fat Head’s Sunshine Daydream, Fat Head’s Bonehead Red and Boulder/Fat Head’s Co-Hopatation. • Braxton Brewing – Hammerdown Homebrew Celebration, Saturday starting at 6:30 pm. Three variations of Storm, all inspired by homebrewers. • Cappy’s Wine and Spirits – Upland and Revolution Collaboration Event, Saturday from 1:00-6:00 pm. Two different collaboration beers: Revved Up Coffee Brown and Revved Up Coffee Blonde. Both will be on tap in addition to some other beers from both breweries. • Ei8ht Ball Brewing – Tonight is Free Bacon Night and they are doing tapping Southern Tier Rhine Cabal. The cost is $8 for a 13 oz tulip. • Keystone Hyde Park – Spring Celebration of Bell’s Brewery today starting at 4:00 pm. Beers include Oarsman, Two Hearted, Oberon, Oatsmobile Pale Ale and a cask conditioned Amber Ale. • Marty’s Hops and Vines – Tapping Ei8ht Ball Hammock Hefeweizen Saturday at 5:00 pm and donating $1 from each pint sold to the Testicular Cancer Society. Happy Hour pricing all day. This week, it’s Madtree Brewing. $1 from every glass sold of Divergent, Soulless and beer from the Sour Tap to will be donated to Artswave. This week, they’re tapping their cask aged Wild Blueberry Hibiscus Blonde Ale and Chef Buddy Fristoe will be serving his smoked pulled pork sliders, tacos and chips & salsa. The beers for this week’s Pint Night Thursdays are: Main Strasse Covington – Dogfish Head Aprihop, Glendale – Stella and Hyde Park – Stone Enjoy By 4/20. This week, it’s Prairie / Brewfist Spaghetti Western Imperial Stout. Six drafts, six bites, $6. This week, it’s Rhinegeist Uncle, Lagunitas Pils, Stiegl Grapefruit Radler, MadTree Rounding Third, Revolution Anti-Hero and Boulder 35th Anniversary Imperial Black IPA. This week, it’s Rhinegeist Truth and Zen. They will be tapping a special cask of a Scottish Ale called Old Gregg at 5:30 pm. Check out their Facebook event page for more information. Register by emailing PrivateDining@MoerleinLH.com. Cost is $55 per person, plus tax + gratuity. Join Christian Moerlein Brewing Co.’s Greg Hardman, MadTree Brewing’s Brady Duncan, Fifty West Brewing Company’s Bobby Slattery, Rhinegeist’s Bob Bonder, and Mt. Carmel Brewing Company’s Mike Dewey as they talk about Cincinnati’s brewing scene past, present, and future. Moderated by Brewery District Executive Director Steve Hampton. Doors open at 6:30 for light bites; featured discussion starts at 7. $3 select craft cans including Rhinegeist Truth, Uinta Brewing Hopnotch IPA and Strongbow Cider. This week, it’s a New Belgium tap takeover as well as a take home the glass night including Yuzu, Cigar City Collaboration, La Folie, Summer Helles and Fat Tire. The beers for this week’s Pint Night Thursdays are: Main Strasse Covington – Oskar Blues Mama’s Little Yella Pils, Glendale – Bell’s Oberon and Hyde Park – Madtree Sol Drifter. This week, it’s select beers from Rhinegeist. A portion of the proceeds from beer sales will be donated to three local groups: Once Upon A Pit, Cincinnati Pit Crew and Adore-A-Bull Rescue. See their Facebook event page for more information. Beers: Quaff Bros. “Gnappy” Pappy Van Winkle Barrel-Aged Brown by MadTree, “Amberdextrous” a Bourbon barrel Amber (Rivertown) & “Quaffanator” Barrel Aged chili pepper Doppelbock by Blank Slate along with Ei8ht Ball Tarnished, Red Drink and something new from Mitch. June 12th from 6:00 – 8:00 pm – Burgers and Beers: Bomb!, Cannons, Rockets and Killer Penguins Oh My! August 7th from 6:00 – 8:00 pm – Burgers and Beers: Bell’s Brewing Co.
August 21st from 6:00 – 8:00 pm – Burgers and Beers: Got Local (Beer)? Buy a logo pint glass with your favorite Rock Bottom beer for $5.95, get it refilled for $3.00 and you keep the glass. Six drafts, six bites, $6. This week’s beers are Rivertown Tom’s Smashing Blonde, Great Lakes Conway’s Irish Ale, Finch’s Fascist Pig, Stone Go To IPA, Jackie O’s Hop Ryot and Brooklyn Dry Irish Stout. This week’s beer is Upland Wheat. The cost is $12 and includes four 5-oz beers and four dishes. For this month, it’s Rivertown Bock with Pretzels & Beer Cheese, Christian Moerlein Doppelbock with Sauerkraut Balls, Great Lakes Conway’s Irish Ale with Bangers & Mash and Moerlein Friend of the Irishman Stout with Vanilla Macaron with Stout Ganache. The beers for this week’s Pint Night Thursdays are: Main Strasse Covington – Guinness, Glendale – Guinness and Hyde Park – Boulder Mojo IPA. Beers include Gnarly Brown, Sprye Rye and Lift Kolsch. 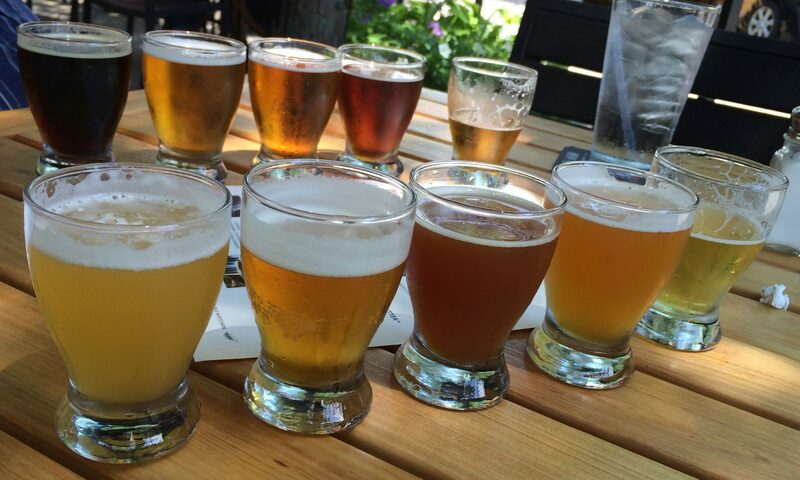 For $25, you get one of each of the three beers, appetizer, dinner, dessert and a glass that’s yours to keep. Call 859-331-4999 to make reservations. Friday, March 14th at 5:00 pm – Triple Digit Turns 2! Help us celebrate our 2nd Anniversary Friday March 14th! We are pulling beers out from our cellar to put on draft, as well as a new variation or two of your favorites. Fireside Pizza Catering & Events will have the wood fired pizza oven up and rolling and DJ Soul Step on hand spinning records. extra 5oz Pours for $2 and extra Full Pints just $4 (excludes the 4 VIP stouts). For the first time, they are also selling 125 VIP tickets for $30. This gets you the same deal as regular tickets BUT guarantees 5 oz. pour of the four very rare stouts in the fest. For more information including how to buy tickets, go to their Facebook event page.